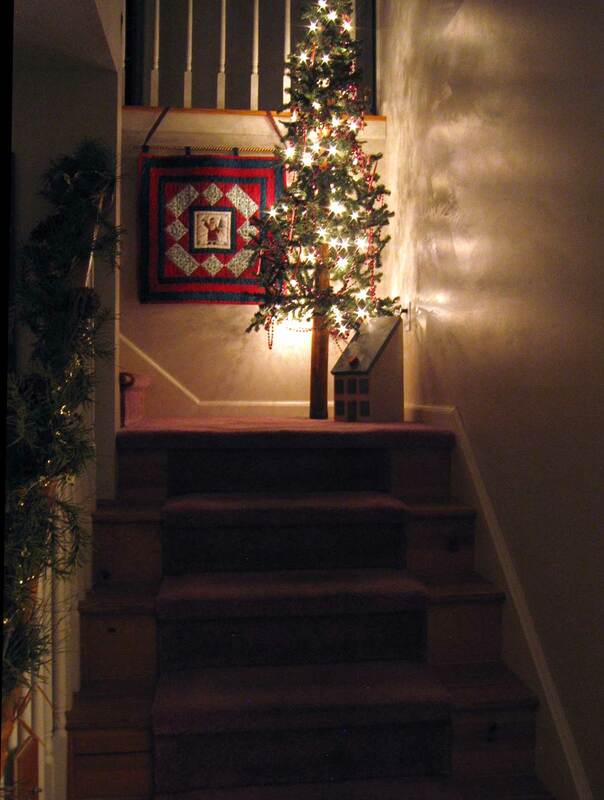 How tacky would it be to leave this Christmas tree on our landing going to the second floor? I love the glow it provides and I don’t have to turn on the overhead light when I go upstairs. The tree was an impulse purchase a few years ago when some friends from out-of-town called to see if they could stop in around Christmas. We normally don’t have people drop in on us and our family wasn’t coming so I didn’t get put any Christmas decorations inside the house. The outside was decorated. I found this six-foot primitive tree at 40% off on Christmas Eve. I grabbed it and some lights and voila! Instant Christmas tree that I could carry. The red beads and lights stay on the tree and after Christmas it lives like that in the basement. I put some candy canes on it this year and called it done. The “big” tree is still up in the living room but all the ornaments are packed away. That tree will go back in the box this week. The rest of the decorations inside and out are put away. If it’s above zero and we still have some light when I get home today, I’ll show you my snowman on the front door. This entry was posted in Christmas, cleaning, decorating and tagged Christmas, decorating by Patti_is_knittinginflashes. Bookmark the permalink. I say LEAVE IT! I love the glow my house has during Christmas. I was sad taking down our tree and let our 10-year old daughter leave up the 2 strands of white lights she hung in her room. It just looks so pretty. I was just saying I didn’t want to take down the tree this year – love the glow! Your tree does look like a winter tree as suggested, but come Spring you should probably bid it Adieu! Enjoy it for now, I say. I think it’s pretty and you should leave it up! Leave it up. It is pretty and a good night light. just change up the decorations. Something with a simple winter theme, like bird’s nests. Or just the lights. I think its charming.